The following chapters include anecdotes which Camani Sensei lived within Matsubayashi-Ryu by himself, with his students and with Grand Master Shoshin Nagamine. We invite you to read them. Is one of the persons who has most deeply impressed me in my life time. At all times he transmitted a sensation of peace almost impossible to comprehend. He was a very affable person; one always felt very comfortable and close to him. In Okinawa, after performing he used to invite us to drink tea with a few biscuits in a site alongside the “dojo”. Conversations with O´Sensei were very relaxed and he always paid great attention to what we said. It wasn’t a “speak for speaking” but a demonstration of authentic interest in our communication. 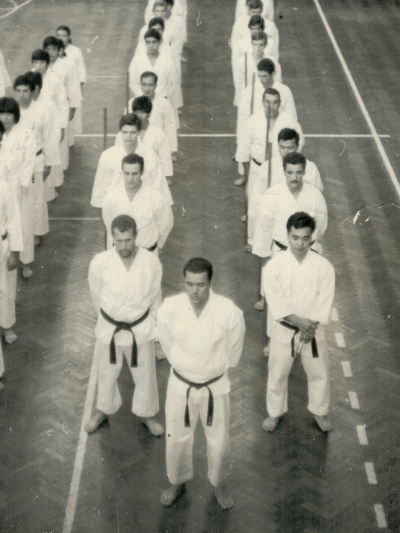 During the month of October 1978 O´Sensei visited Argentina. A welcome dinner in his honour was celebrated. In these occasions it was normal to invite some students to say some words. I remember there was an extremely timid student, it was a problem form him. We all tried to help this student to overcome his problem. We therefore invited him to express some words. He became very tense. All of us started to pronounce his name as if we belonged to a chorus. He became each time more tense leaving the sensation that he would not be able to overcome the anguished situation. Suddenly O´Sensei Nagamine intervened. An absolute silence invaded the premise. With the greatest calm our Master expressed: “Two opposed forces have been created, on one hand a group of persons want a student to put a certain action into practice and on the other hand a person is feeling very bad as a consequence of this act. These are the facts, please don’t insist. If the student wishes, he will stand up and say something”. Obviously O´Senseis words caused me a very deep impression. It was as if he perceived absolute reality with incredible plainness. 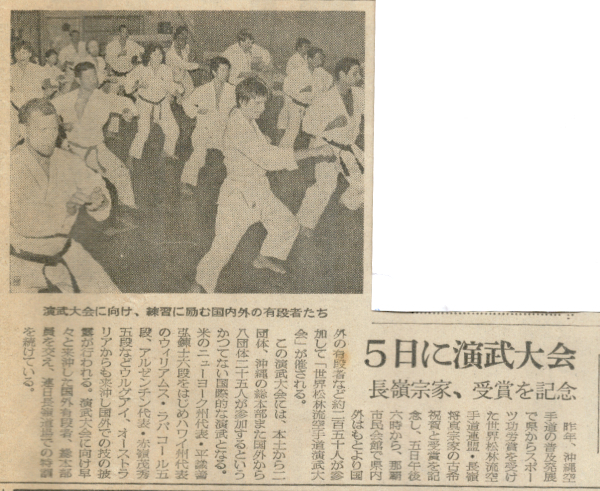 In Okinawa (1980) on occasion of the World Wide Karate-do Demonstration held in the Naha Theatre a celebration took place during Saturday night. It was a very pleasant meeting. At a given moment at approximately 11.30 pm O´Sensei Nagamine interrupted and said he was very pleased to see that the celebration was very live and that we could continue until we wished. He added: “please enjoy yourselves but I must go to rest”. All so natural and plain. To sit in “Zazen” in specific “Zazen” practice or after Karate-do training, his attitude was so natural that it was almost impossible to be assimilated, at least for me. He sat as if any person would take a seat in a public transport for example. Everything was so natural for O´Sensei. The last time I had the immense fortune to meet O´Sensei was during February 1997. Our Great Master was already 90 years old. The first class (Mondays through Fridays) of “Zazen” started at 6 am. I remember it was pitch dark. O´Sensei started the class with warming up and stretching exercises. He firstly run around the “Dojo”. We (5 or 6 students) ran behind him in a row. Suddenly, without a word, he left us running to pick up what seemed to be a hair or something similar from the floor of the “Dojo”. We kept on running while O´Sensei very meticulously deposited the “hair” in a container which was to one side. We never spoke on the subject, but my personal interpretation is that his respect for the place of practice (Dojo) was so great that he could not overlook a single hair (invisible for us) on its floor surface. O´Sensei permanently received Matsubayashi-Ryu students from different parts of the world. During February 1997 I visited Okinawa and coincided with a student who came from Canada. To O´Senseis eyes we had exactly the same defect as I had: it wasn’t a technical defect (easy to correct) but a general defect related to our body attitude (extremely difficult to overcome). O´Sensei considered it a very important problem (by no means superficial). He insisted so much that he told us to forget power, speed, “kime”, . . . . . . . ., to forget everything. We should only concentrate all our being on correcting our body attitude. Accustomed to perform at full power and energy, it was for me a real torture to perform without abandoning his instructions. To such an extent that the only way I could fully follow his instructions was to perform the techniques at very slow motion. I wasn’t capable of increasing speed without abandoning our Masters instructions. Only then O´Sensei approved my performance. When I left Okinawa, I could only perform at a very slow motion level. I never managed to increase speed without betrayi8ng O´Senseis instructions. I felt as if I started again, as if I put my “gi” for the first time (at that point in time I had 25 years of practice on my back). When I greeted O´Sensei before leaving Okinawa, I was absolutely amazed; he told me I had progressed a lot, I couldn’t believe it. I kept on training fully respecting his instructions. Only after 2 or 3 months I felt I could gradually increase my movement speed without betraying his indications. Obviously, considering that students are a reflected image of their Sensei, all my pupils had to go through the same struggle. I remember that on occasions they left as if they wanted to cry, the same as me: they could not perform the techniques with “kime” without betraying the important deep corrections. The above mentioned description represented a very important point of inflection in my practice, as if suddenly a flash of light clearly illuminated my path. It also left me a very important teaching: when something fundamental must be corrected in our practice, it must be absolutely corrected, no matter the effort we must put into it; if we look over it, we will never overcome the difficulty and, even if the minimum reminiscence remains alive, it will represent a very heavy stone in our progress within the art. Okinawa (April 1980). A world presentation of Matsubayashi-Ryu, presided by the head of the School (O´Sensei Shoshin Nagamine) was held at the Naha Theater (the most important of the island). Delegations from Mexico, Australia, several states of the U.S.A., etc. participated in the event. The South American delegation was represented by Shigehide Akamine Sensei accompanied by a student from Uruguay and five from the Argentine Republic. The presentation was a success and it also was the starting point of a 15 day seminar on Matsubayashi-Ryu. The next day, the news of the event (including comments and a photograph) appeared in a local newspaper. The big surprise was to see myself clearly in the lower left corner. It was an enormous coincidence that remained as a nice anecdote worth remembering. Sydney Airport (1986). During our emigration flight to Australia, before landing in Sydney, they gave us a form to be filled. In one of the questions they asked: Are you carrying any weapons? I didn’t know what to put, in my luggage I was carrying a pair of “Sai”, of “Bo” and of “Nunchaku”. After thinking about it a good while, I considered that I didn’t want to have any trouble right from the beginning in our new country. So, I decided to leave the space in blank and ask the customs officer to help me out. When they saw the “Nunchaku”, no doubt, they were forbidden in Australia. So, they confiscated them and sent them to be deposited in a Customs Department they had in the Airport. It was not allowed to enter Australia with “Nunchaku”. They then had a look at the “Bo”. They tried to bend it, to twist and untwist it, to take it apart. They finally said: “O.K., you can take this”. Finally, when they saw the “Sai” they asked: “What is this?” “What do you use it for?” I answered: “It is very difficult to explain in words, if you like, I can show you how it is used”. OK they replied. I needed an approximate 5mx5m space which was duly prepared. So, I performed “Sai Kata Ichi” right from the beginning to the end. All surrounding activity (custom authorities, passengers, etc.) paralysed, absorbed by the “Kata”. When I finished the performance, the officer said: “OK, you can enter with them”. Improvised “Makiwara”. We started our lives as immigrants in Sydney (1986). Among several basic priorities I had to find a sort of private place to practice Karate-do. No problem, I found an open space very close to our flat. After practicing three or four times, I noticed that forming part of a limiting hedge, there was a wire fence with wooden posts. I tied a piece of leather to one of the posts, which served me as an improvised “makiwara”. One night (08.00 to 08.30 pm) while I was practicing with this “makiwara”, a lady approached me from behind and asked: “Are you all right?” Yes, I answered, I am all right. “Are you sure?” She insisted. Yes, I’m OK, don’t worry. One day a student (sho-dan) coming from another school and interested in Matsubayashi-Ryu participated in our usual practice. During approximately one hour in a half we practiced basic techniques (kihon), in detail, no “kata”. Due to a private commitment, our visitor had to leave. When greeting us, he told one of my most advanced disciples: “o.k., I leave you with Sensei so that you can practice more advanced techniques”. My disciple answered: “It is not a question of practicing more advanced techniques, but of enjoying the techniques we practice”. After this reply I thought to myself: Evidently my disciple took good advantage of all these years of practice. One day one of my disciples changed his address moving from one town to another. In his new emplacement he had the problem that he didn’t have enough space to practice karate adequately. He didn’t know what to do. I told him not to worry, that if he didn’t have enough space to practice “kata” the only thing he had to do was to find a small minimum space (for example 2 meters x 2 meters) to be able to practice basic techniques. Here, the most important issue was to keep sensations and continue advancing in the “way”. Inclusive, if he would forget the sequence of movements of the “kata” it would not be an important issue. He would surely remember them in a very short period of time when circumstances would become normal again. The opposite, i.e. if he abandoned practice all together he would loose important sensations and therefore he would not have continued advancing in the way. Should this have happened, it would have taken a very long time to recover sensations and therefore continue following the “way”; even if he remembered in a short period of time the sequence of movements of the “kata”. It all took place as described. The student was always grateful for this.